Blumenbild tapestry shows the work of Dutch painter, Rachel Ruysch. Ruysch was 76 years old when she painted “Blumenbild”. Trained in the celebrated Dutch tradition, she painted some of the most realistic paintings of flowers ever put to canvas. Perhaps the fact that her father was a botanist had something to do with her love of flowers. She was taught by Willem van Aelst and spent most of her career in Amsterdam. Vermeer and Kalf were her heroes, but her love was still lifes of flowers. Ruysch’s work is instantly recognizable. Her subjects were usually painted against a dark background, which made the colors even more vibrant. All of her work with flowers included insects such as bees and butterflies. In “Blumenbild” we see an arrangement of fresh flowers together with a bird’s nest. 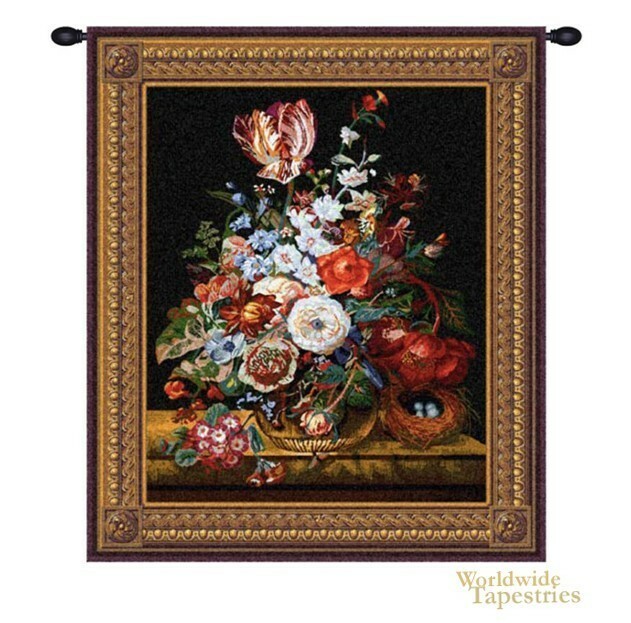 This tapestry is beautifully woven, retaining the vibrancy of Ruysch’s original work. Blumenbild tapestry is lined and has a tunnel for easy hanging. Note: tapestry rod and tassels, where pictured, are purchased separately.